It has been a long time since I’ve shared a beauty post on This Northern Gal but I realised the other day that it was time to change that! I’ve also noticed that I have settled into a lovely little routine when it comes to my makeup that I wanted to share. I don’t have that much time to get ready in the morning so it is super important for me that my routine is as streamlined as possible. Now, I have a handful of products that I reach for first thing to make sure that I look as presentable as I can, without wasting precious moments before work. And, just to make it super clear, all of the products mentioned in this post are cruelty free. I’ve been only using cruelty free makeup for the last few years and honestly can’t imagine going back on that. So first of all, let’s talk about foundation. Many of you know that I used to swear by the Barry M Flawless Matte Finish Foundation. I still like it but I had noticed that it didn’t seem to last the whole day. My skin has been having a bit of a freak out so it is probably more of a me thing than the foundation. It did mean however that I was in the market for a new foundation and ended up picking one up on a whim while it was on offer in Superdrug. It was the B. Flawless Silk Foundation and I am really liking it. Admittedly, it took me a little while to get used to the application (use a tiny amount with a foundation brush) but it survives a whole day at work and has a gorgeous finish. It also has SPF15 in it, which is a massive bonus AND it is pale enough for me. The foundation isn’t quite heavy duty enough for the dark circles under my eyes so I also use the MUA Cover and Conceal in Fair. I’ve used this for years and it is one of the only things that can make me look somewhat awake on a morning. It’s an absolute bargain too. In terms of eyeshadow, I have fallen back in love with my Too Faced Boudoir Eyes palette and have been using it almost daily. It has colours that are subtle enough to wear to work but not too boring. I don’t think I will ever grow out of my love for shimmery eyeshadow. I actually bought this palette an embarrassingly long time ago but it is one that I come back to again and again. The colours last all day long, even if I forget to use eye primer. Which I do waaay too often. My final step is mascara and I am still in love with the Barry M Feature Length mascara. I use this daily and it is such a dream to use. And there you have it! 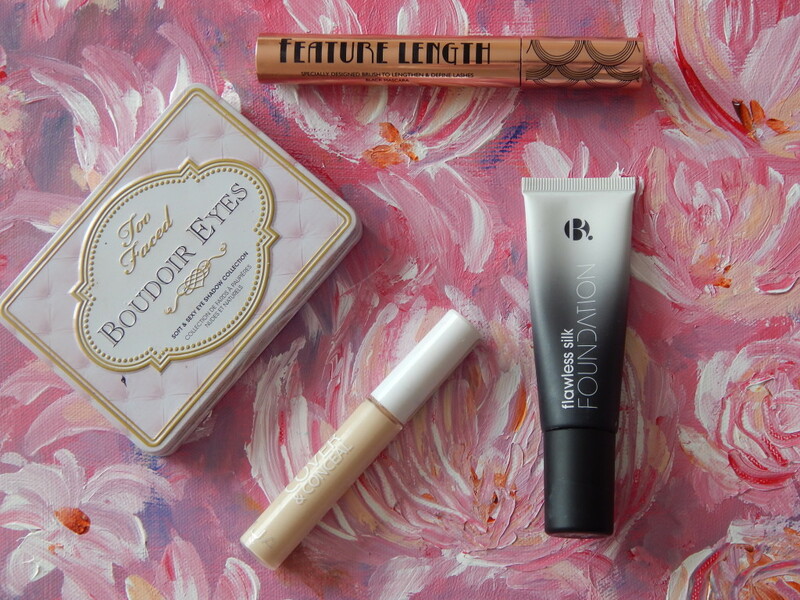 My current make up favourites!